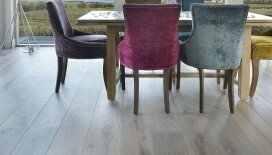 Brushed oak is our range of contemporary, textured flooring products. To create this effect, wire brushes are used to pull out the softer spring wood, exposing the harder summer wood, thus accentuating the grain and creating a beautifully textured surface. The Brushed range is available in a Character, Character/Prime and Prime grade, all of which feature boards which are carefully hand graded and selected to your specification. Ideal for naturally inspired interiors. The beautifully prominent figuring and large hand-filled and brushed knots, illustrate the true rustic nature of this product. This grade retains a rustic charm but the knots are much smaller than those featuring in a Character grade board. This is a great option for those who like the natural effect of the wood but prefer a slightly more uniform appearance. Clean, contemporary and incredibly stylish. Each board has been carefully selected to ensure that the beautiful figuring of the wood is highlighted but, only small pre-filled and brushed knots are present.